To order you can phone us on (0044) 01202 874737, or click here to e-mail us and request a pro-forma invoice, please tell us which materials you require. We accept cheques/postal order payment by post, credit card payment by phone only please for security purposes, PLEASE DO NOT SEND CARD DETAILS BY E-MAIL! Materials are principally supplied by mail order, if you wish to collect in person at our shop, please phone first to avoid disappointment. All quoted prices INCLUDE VAT. We accept all major credit cards on orders over £10. VERY IMPORTANT - Non-UK customers. Please be aware that our DVDs are UK/European standard PAL format region free (0). They will play in all countries using the PAL standard and in the rest of the World through most computer DVD players. In areas that use NTSC format, they will only play through standard TV/DVD players if they are multi-system "all format" enabled. If your area is not PAL standard, check out your TV/DVD/computer system before ordering please, especially if your region uses NTSC, (mainly USA & Canada). We can only accept returns of discs that are faulty, we cannot be held responsible for non compatibility issues from overseas. Introduction - How to recognise which method of seating is needed on the chair frame. 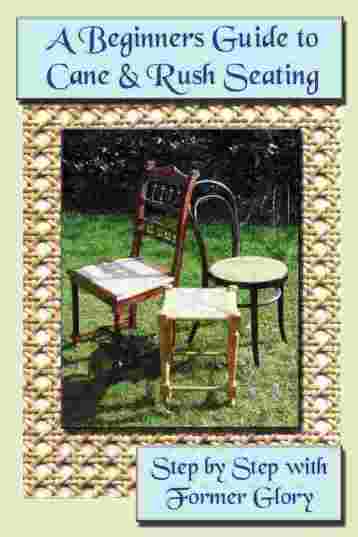 Where to buy antique chairs and what to look out for, how to spot hidden damage and poor repairs. What can be successfully restored and more importantly, what can not, plus a description of the materials used and where they come from. Rush Stool - The first and easiest project. How to re-rush a simple footstool using paper fibre. Rush Chair - The next stage. How to work rush onto a "trapezoidal" frame, and how to "stuff" the seats. Cane Panel Chair - How to replace pre-woven cane panelling including how to tint the canework to match older panels. 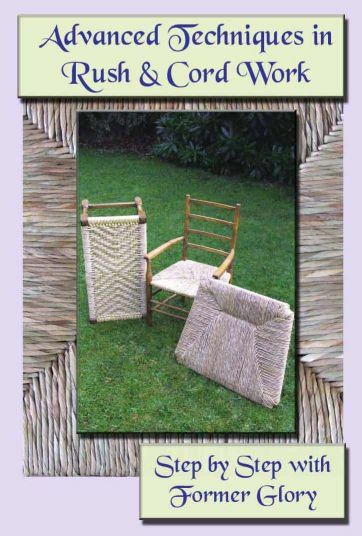 Hand Woven Cane Chair - The six stages of weaving clearly explained including the preparation of the frame beforehand. The DVD has been filmed at various locations over two years and is informal, we hope that by watching us work in our normal way you will find the instruction easier to follow. 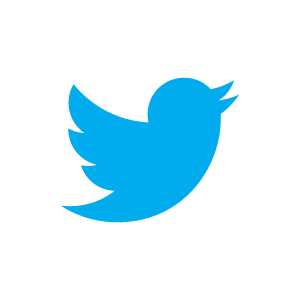 Concise written instructions have also been included giving extra useful information. There is one short extra chapter included. During the course of filming we took on a personal project - the restoration of a Bedford classic mahogany horsebox - it took us 800 hours labour and three months to complete. This extra chapter is the story of "Bernard" the Bedford. Introduction - Our welcome and what it is like demonstrating craft at large events. French Steamer Method- How to use the steamer tool to weave fine French cane. 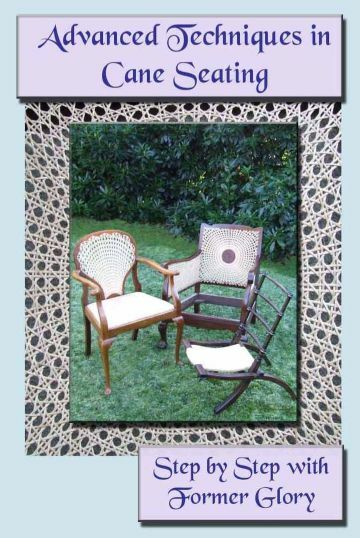 Bergere - How to work on larger "bergere" furniture with double sided panels and "blind" canework. Medallion - The processes involved in creating the ever popular "medallion" weave are shown in detail. Fan Back - Sunburst or sunrise cane backs, a variation of medallion work shown being worked on a very pretty walnut chair. Close Woven - The intricacies of two knotted close woven cane patterns explained clearly. Curiosities - A few unusual items that have passed through our workshops. "Covered Corner Drop In" Seat Pads - Three different methods of working a drop in seat that has weaving right into the corners and how to work the continental rush pattern including the "Magistretti" design. Hand Twisted Rush - How to prepare and twist rush to create the ages old traditional seat. This chapter also includes two different methods of squaring up a trapezoidal chair. "Arm Through" Seats - The processes involved in removing the arms and working a seat where the arm support passes through the seat rail. Danish Cord Work - How to weave the popular two by two pattern onto single and double railed chairs. Seagrass/Mixed Media - A short chapter of ideas! Farewell and Out Takes - An extra. It's the last DVD in the Trilogy, so have a laugh at our expense! How to replace a broken cane seat in a chair. 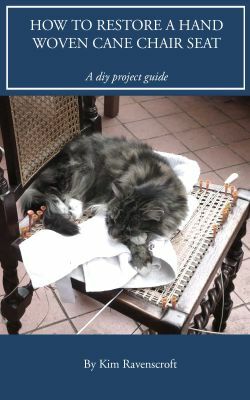 A comprehensive fully illustrated diy guide for beginners clearly explaining every part of the six way weaving process. Tried and tested for many years, this guide has helped thousands of people restore and recycle loads of furniture that may otherwise have been dumped! A great way to start a new hobby, pastime or possibly even a profession.